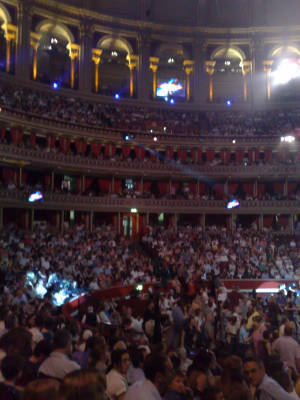 Adam J Purcell reminisces about his visit to the Royal Albert Hall, London, for the Doctor Who Prom 2008 on the 27th of July. 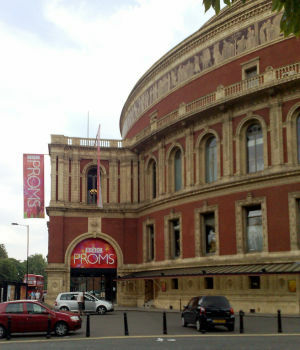 We were very lucky indeed to grab six tickets to the 13th BBC Prom of their 2008 season - The Music of Doctor Who. I must entirely thank Karen for this, she organised the tickets - I just turned up with a big grin on my face! As did thousands of other people, including lots of small people (besides Jimmy Vee, that is) for whom it is probably their first ever live concert. I doubt it will be their last either - what a great way to introduce children to live orchestral music! To say it was a success would be an understatement. I shouldn't get ahead of myself, however. Some context! Back on the 19th of November 2006 the BBC, mainly the Doctor Who Production Office, I believe, put on the first Doctor Who concert. This was held at the Millenium Centre in Cardiff (as seen in so many Torchwood establishing shots) and famously sold out almost instantly. It was a charity event with some of the proceeds going to the annual BBC Children in Need telethon event. We tried to get tickets for that but failed. Nonetheless it was an amazing event. I'd only days before turned my TV room into a proper 'home cinema' and listened to the event live via a satellite feed of BBC Radio 3. It sounded fantastic on my surround speakers, the atmosphere at the Millenium Centre almost seemed to leak through into my room. Nonetheless it must have been even better to be there in person. This time, at the Prom, we had our chance to find out. It was an eleven o'clock, yes in the morning, start time for the Prom. We wanted to be there at least half an hour before that. The train to catch from Three Bridges, was therefore the 08:32. Gives us a bit of breathing space. I agreed to pick up my fellow three Crawley attendees at 08:00 and we'd drive on to the train station from there. This meant me leaving home at about 07:45. Yes, a 06:30 wake up on a Sunday morning! I was sufficiently excited to be going that it didn't matter. I'd have gone the night without sleep if I'd have had to! Of course all this excitement and early rising would catch up with me later in the day. But that's skipping ahead again! Just as we exit from the correct tube station entrance (if an entrance can be an exit) we run into some friends from many a year back - Alex and Kevan of the Whoshop. After a quick chat with them we stride off toward the Albert Hall itself. Quite a stream of people were heading in our general direction. Given it was just gone 10AM we assumed they were also prom goers. Sure enough, quite a decent queue was forming at the multitude of entrances to the Royal Albert Hall itself. There was still a good three quarters of an hour or so to go before the performance began, too. Soon we were joined by our two London friends, to make the finaly total of six. Not that we only have two London friends but you know what I mean! We weren't hanging around too long before the doors opened and we flooded in. The BBC could easily have charged 'normal' concert fees for this Prom. By normal I'm thinking about £20 down at our local arts centre. That's pretty affordable for most. Frankly the BBC could probably have gone higher than that, maybe up to West End type prices of nearer £50-£60. This event was also sold out almost immediately and I'm sure they could still have filled the (almost) 6000 seats even at £50 a pop. That wasn't the point of the Prom, however. The Proms, in general, were designed to be affordable and informal to bring in people who wouldn't normally attend classical concerts. That's why the concept of doing a Doctor Who prom is so good. Some have complained about the Proms dumbing down but they've entirely missed the point. But I'm getting off the point! Tickets to get into this wonderful event were £5 - £10! Incredible! Even the programme (the printed booklet type, that is) was unusually cheap at £2.50 each - you are regularly charged £4 - £5 for a much inferior programme to the one we got here. I have to say that the team behind the programme guide did a fantastic job. It's got quite an indepth piece by Mark Ayres on the history of Doctor Who music. Another article on the BBC Radiophonic Workshop (that was given special mention by Freema in the actual concert too - it will have been 50 years old in a couple of months or so). There's an interview wth Freema and Who director Euros Lyn (who also did the Music of the Spheres but more on that later). Also in there is the standard running order, with detailed description of each piece, and a look at the people involved and the Orchestra (BBC Philharmonic) and Choir (London Philharmonic). To top it all off the programme guide is cut into the shape of a Police Box! All very impressive, especially for a one off performance such as this. Like the entire production it oozes quality! Onto the concert itself! We took our seats (mine being Stalls M, Row 10, Seat 125 via Door 9 - I said there were a lot of entrances, at least 12!) 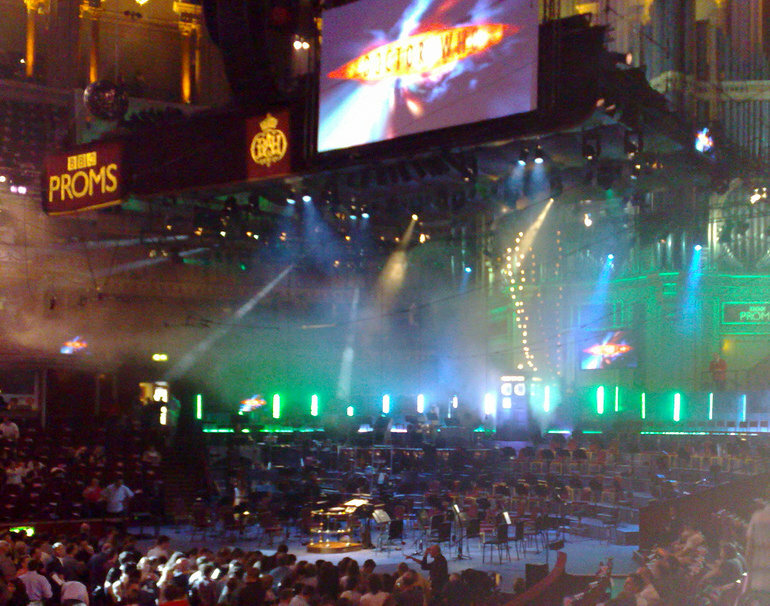 We had a very good view of the orchestra and the large screen above and in front of them and the TARDIS Police Box behind them (and some graffiti of 'Bad Wolf' on the walls behind them, too). The entire place was filled with a thin smoke to give it a bit of atmosphere and shine the odd coloured light through. During the Doctor Who music segments the screen would play clips of Doctor Who (only the new BBC Wales version) that were, on the whole, appropriate to the music. That really added an extra dimension to the whole thing, it was almost like watching a trailer with live music! I really hope that they release some videos of those pieces on YouTube. Ben Foster strided onto the stage and they began with the 'Concert Prologue' which was The Doctor's Theme featuring the original solo vocalist Melanie Pappenheim. We then went immediately, following a very swift, neigh seemless, switch of conductor to Stephen Bell, into Aaron Copland's Fanfare for the Common Man and then our first round of applause. Obviously the classical music was going down well enough with the audience! All the Strange, Strange Creatures, the famous Murray Gold piece that seems to play behind almost every modern Doctor Who trailer, was up next. A well known and well loved piece. Again, it was great to hear it live. What's more they decided to make things more interesting by sending an array of such strange, strange creatures into the audience! We'd already seen Ood milling around as people were filtering into the hall at the beginning. They came out to play again, joined by Judoon (one without his helmet, so you could see his inner rhino). The Sontarans filed in next, just two I think. Again, one without his helmet. At the time I thought he looked spookily similiar to the Sontaran second in command, Commander Skorr, from the recent two parter, The Sontaran Stratagem. Sure enough, it was indeed the real deal - the vertically challenged Dan Starkey himself! Skorr motioned to his Sontaran underling to follow him onto the stage where they both performed some Sontar-Ha action! The crowd were particularly excited by these monterous antics! I have to say that, personally, as much fun as it was I tried not to be distracted too much by the prowling monsters but instead concentrate on the music and the orchestra - I always like to watch an orchestra doing its stuff live. Next up it was the return of conductor Stephen Bell. All of the Murray Gold pieces were conducted by Ben Foster, who acts as orchestrator and conductor on the series itself, with the BBC National Orchestra of Wales. Stephen Bell, who works with the BBC Philmarmonic, conducted all the non-Who music. The next of which was the UK premiere of Mark-Anothony Turnage's The Torino Scale. A rather cacophonous piece about the mayhem that an ensuing asteroid impact would have an Earth. The Torino Scale that the piece is named after 'a measuring system used when predicting the likelihood of asteroids hitting Earth' and is not to be confused with The Lou Ferrigno Scale (which is more to do with finding the right midget actors to make the Hulk look bigger than he really is, or maybe not). The Torino Scale composer was himself in the audience and had a shout out from Freema. An obvious piece for a 'Sci Fi Prom' but I'm not sure that musically it really fitted in with Murray Gold's work or that of Copland or Holst, etc. Talking of Gustav Holst, his famous piece Jupiter from The Planets suite was up next. Always a popular piece, undoutably Holst's most popular work. I personally think Mars might have been a better choice for this event but a bit of Holst is always welcome! The Ood, in particular, seemed to like it as three of them wandered in, walked down the aisles and into the arena in the centre (where the people with the non-seating tickets were). There they seemed to do some kind of worship like thing in time with Jupiter. Very odd Ood. Then it was back to Murray Gold's greatest hits conducted by Ben Foster. The Doctor Forever. As with all the Who pieces it was sensory overload - hearing the music live was amazing, on top of that my eyes were simultaneously drawn between the big screen with its clips and the orchestra/choir below. I have to say that some of these pieces really were quite emotional to listen too, especially alongside some of the clips they chose (and it got far more intense towards the end of the second half). Excellent stuff. Back to now, though. Then we were treated with a short (about 1 1/2 minutes) version of Rose's Theme. Finally for this segement, indeed this half of the concert already, was the curiously named Martha vs. the Master. Basically Martha's Theme interweved with the Master's Theme, as clearly from the Last of the Timelords. Just before the interval we were treated to the Music of the Spheres. This was a specially filmed scene of the Doctor (blue suited - he must have had more than one blue suit!) in the TARDIS (the console room of course - it's the only set they ever use for these 'special scenes'). As he is companionless at the moment it starts with him on his own listening to the Music of the Spheres - 'the Universe's gravity patterns fed through the TARDIS harmonic filter producing a musical sound.' Apparently he's putting the finishing touches to a new musical masterpiece he's penned himself. Then, with little warning, one of The Graske teleports into the TARDIS (console room, of course, no telling how many others might have teleported into other parts of the TARDIS over the years only to get lost forever in its vast interior, possibly fighting with a lost Cyberman or two!) The Graske warns him that about a space portal that is about to open. Sure enough, it does. Through to the Albert Hall - yes, it's time for a bit of audience participation! Sadly the scene was prefilmed, otherwise they could have taken the interaction a bit further than the panto standards of asking the audience to say hello and then asking them to say it a bit louder! After a bit of interaction the Doctor throws his symphony, Ode to the Universe, in sheet music form, through to the orchestra in the Albert Hall and proceeds to conduct them himself. In the meantime The Graske has slipped through the portal and starts running amok in the Albert Hall! Having stolen the Doctor's water pistol (as seen in The Fires of Pompeii) he starts squirting the people down in the arena and goes on to attack a some of the orchestra players! Of course the Doctor pulls him back (by reversing the neutron flow!) into the TARDIS and then reverses him teleport to send him back from whence he came. It was a very amusing little piece which I'm sure worked a lot better being there than it could possibly have done for those viewing it at home, certainly the Albert Hall audience really got into the spirit of it. A very good way to end the first act! Act two, then. Stephen Bell is back which can only mean some non-Who music. Kind of. The first piece of this act has certainly featured in Doctor Who at least once over the years, it's Wagner's fabulous Ride of the Valkyries. No clips to accompany this one, of course, so there was nothing to distract from watching the orchestra doing absolutely amazing work! Guest presenters Noel Clarke and Camille Coduri were cheered onto the stage next to introduce the next set of Doctor Who tunes. They are quickly chased off the stage by invading Daleks who (for some inexplicable reason!) want to change time to make the Proms only have Dalek music. The Dalek on the stage introduces their creator, Davros, as he elevates up into the middle of the Albert Hall from below. Yes, it really is Julian Bleach in the full Davros make up! 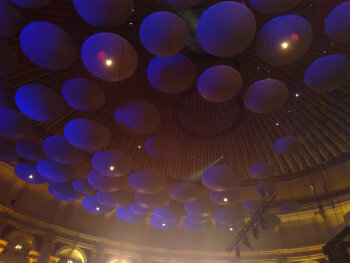 He announces that the Albert Hall will be his new palace, the center of a new Dalek empire. The Dalek menaces Ben Foster to conduct some Dalek music. They play a suite of music from the various Dalek stories from the past four years as Davros slowly rotates around on the spot, glaring at the audience as he does so! Of course Dalek music is heavily choir based these days and the London Philharmonic Choir did a great job with these pieces, all 100 strong of them! Sadly Davros and the Daleks then go away. Julian Bleach must have been in make up for hours and on stage for only about 8 minutes! I can't imagine that he or his fellow 'monsters' were very confortable in the heat either - it was quite warm in there even without being covered with latex! Next up was probably the biggest cheering of the day. The surprise appearance of Catherine Tate on the stage caused quite a stir. She wasn't listed in the programme (not that I'd paid much attention to it before the performance. I don't know how much of the cheering was because she was unexpected and how much was just plain appreciation of all she'd done on the TV series itself. I'd like to think it's the latter. I was one of many naysayers when it was announced that she'd be back as a regular companion for 2008. I was do very wrong and I'm far from the only person to acknowledge this. She did such as amazing job. She certainly deserves a few awards. That's certainly why I was cheering - I didn't know that she wasn't in the programme guide at that time. I think was really quite moved by the reception she got too. She was also the most natural on the stage at the Albert Hall, presumably thanks to her extensive stage acting history. Anyway, enough about Catherine Tate. She introduced the next segment, Donna's Theme, The Girl in the Fireplace and Astrid's Theme - the other women in the Doctor's life after the previous Rose's Theme and Martha's Theme. Freema made a reappearance to introduce Sergey Prokofiev's Montagues and Capulets from his Romeo and Juliet ballet, aka Dance of the Knights. Another very famous piece and one I've like since I first really got to know it playing the 8-bit Atari computer game of the film 'War Games'. What I didn't know was that this is now most famous, in the UK at least (possibly USA too), as the theme to The Apprentice... Probably no better or worse to know it through that than an ancient computer game but still! Next up is the excellent This is Gallifrey: Our Childhood, Our Home. A fantastic piece of music made all the better by the full might of the BBC Philharmonic. Despite the wonderful work of the orchestra on this one it did mark the only time in the concert when I thought the Doctor Who clips took away from the music rather than added to it. The music evokes such amazing pictures in your mind and what they put on the screen didn't match at all what was in my head. That was a little jarring. To be fair they didn't have much to work with. The title gives you a pretty good idea what should have been on screen: This is Gallifrey: Our Childhood, Our Home. The wonder, the splendor, the loss. There just aren't the clips in Doctor Who to cover that. All they had were he few, but great, clips of Gallifrey from Last of the Time Lords. The rest were clips of John Simm's Master being a bit wacky. Didn't fit. A minor disapointment that was easily outweighed by the live rendition of the wonderful music. More soul wrenching music and this time with clips that made it all the more emotional. Doomsday. Need I say anymore? Probably. Melanie Papperheim returned to stand by the Police Box at the back of the orchestra to perform another amazingly memorable vocal solo of Rose's and the Doctor's loss at the end of season two. It can't help but bring a tear to the eye. Certainly did to me, well didn't we all fall a bit in love with Rose? Another tear jerker was up next, this time happier sorts of tears! The Doctor's Theme melding through into that wonderful theme when the Doctors and friends were returning Earth home in Journey's End which, for the first time, we find out is called Song of Freedom. Another heavily choral piece. According to Freema this also represents her happiest day on set filming Doctor Who - the day they were all there, around the console, having a wonderful time! Seems appropriate. Oh, and if you've heard the Radio 3 version and are wondering what that bang is towards the end of Song of Freedom - that was a massive party popper going off and covering a lot of the audience! To close the proceedings Tim Philips was introduced to sing 'Song for Ten', he did the original as featured on The Christmas Invasion. He was wearing a very 10th Doctorish suit which is appropriate given the song is basically coming from the Doctor's Id. Also Murray Gold himself sneaked onto the stage to play the piano for this song and remained for the next. I have to say this wasn't the best performance of Song for Ten I've heard, something was a little off about it. That's a shame as I much perfer the sound of the original and would like to hear the extended version in that style, especially with the false ending as one of the other three versions has! Song for Ten has a complicated set of historical versions! That went straight into the Doctor Who theme to close up. A decent enough rendition considering this was an orchestra and the Doctor Who theme, at least official versions, have never been fully orchestral (okay, perhaps save the McGann version). Standing ovations for several minutes were eventually followed by a quick reprise of the Song of Freedom. Sadly the Radio 3 version I've been listening to while writing this (to help bring back those wonderful memories) finished before the encore. Probably just as well - a few minutes of clapping probably doesn't make the most entertaining radio! After the encore the orchestra and choir started to file out, it became clear that no amount of clapping would bring them back this time. Don't stop, we want more! I think everyone in the audience would have been happy to spend all day there listening to them. Sadly that couldn't be! All in all, a truly incredible event. I feel so previledged to have attended, I really do. I knew it would be good but being there in person - it really was the most fantastic concert I've ever attended. Would I go again? In a second! The implication was that there will be more. More than once it was mentioned that this was 'the first' Doctor Who Prom. I really hope they do more. I think from every measure you take to take it was an astounding success. They really put their all into it, almost certainly the most expensive Prom of the season, including the famous Last Night. Everything just worked magnificently. All the critics have been praising it and I'm sure no one left there disappointed. I really hope they do it again next year. I really hope we can get tickets again. I'd highly recommend you all to try to get tickets. Just be warned - if you get some and we don't I'll fight you for them!